Update: With soccer season coming up, I thought it would be a good time to revisit head gear for kids. Last season, we had two girls out with concussions. They were not soccer related, but a concussion is a concussion. Head gear, although not popular or fashionable, can help protect your child’s noggin. Do you remember the 1980’s anti drug commercial with the frying egg -“This is your head, this is your head on drugs.” I can’t help but think about it every time my daughter steps on the soccer pitch, except I’m not thinking about drugs. What’s going through my mind is “This is your brain, this is your brain after a concussion.” It might as well be scrambled or fried eggs. 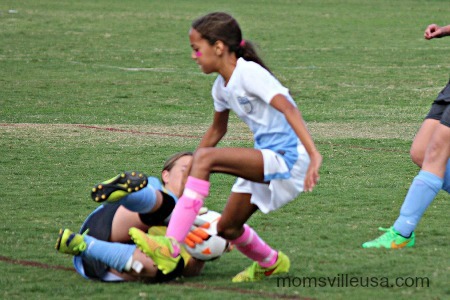 My daughter plays competitive soccer. Her favorite position is goalkeeper. At first, it was just a matter of buying some inexpensive gloves to help her grip the ball better. But as the level of competition has increased with each age bracket, so does the amount of protective gear she wears. As you can see above, she puts herself in a position to be knocked around. In the past few months she has taken more balls to the face and head than I am comfortable with. I hate to say it, but most blows have come from her own teammates (not hearing her call the ball or in the heat of the moment crossing in front of her as she tries to make saves.) I know that statistic will change as they get older, but the amount of blows might not. Instead of coming from her own teammates, they will come from opposing players. This winter my daughter is playing Futsal, which is a modified form of soccer played indoors on hard surfaces like a basketball court. So now I can add “head thumping on the court” to my list of concerns. I’m not going to make my daughter live in a bubble, but I’m going to make sure she has some form of protection. This season I bought her the Full90 Performance Headgear after seeing Chelsea Goalkeeper Petr Cech wearing a similar one during a match. 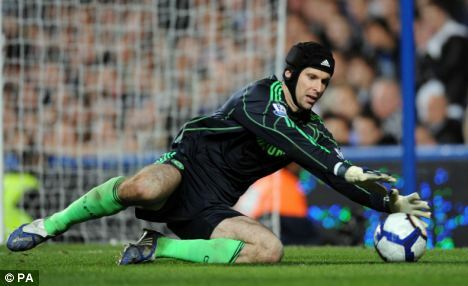 In 2006, Cech suffered a serious head injury and almost lost his life after getting a knee to the head. His headgear has become his trademark. There was a lot of discussion in my house about requiring our daughter to wear the Full90 Performance Headgear. Would she be laughed at by other kids? Would other parents think I went too far? Guess what, her teammates actually thought it was pretty cool, and other parents have told me they were thinking of purchasing something similar for their kids. I’m not going to say, the Full90 Performance Headgear will prevent concussions from happening, but hopefully it will offer some protection. I guess something is better than nothing. Note: After I wrote this post, we had an incident where a player from the other futsal team landed on my daughter and went over her head as she tried to save a goal. She wasn’t hurt, but I have to ask myself, would there be a different outcome if she were not wearing her Full90 Performance Headgear? Disclaimer: I bought this headgear for my daughter. I have not been compensated for this post. My opinion is my own. Having said that, I am also am Amazon Affiliate, which means if you want to buy one as well, and you buy it by clicking on the helmet link above, I might earn.. like 1 cent. This might be “protected” vs “fitting in” but I’m guessing than sooner than later more protective gear will be the norm. We got a call this summer from sleepaway soccer camp. C had been taken out during goal keeping training. She did’t wear her helmet and she’s very lucky. After the incident she wore it everyday during camp, regardless what other kids thought.